For any of your important events or get-together, whether it be weddings and banquets or meetings, conventions, lunches, we offer quality meals, and optimum service, guaranteed by our modern organizational structure and our great experience and professionalism. Locations, in Italy, are at the customer’s will, though if you are at a loss for a venue, the Piccolo Mondo has many places at disposal that you can choose from – especially in Tuscany, from your typical dining halls, to villas and castles in gorgeous surroundings. The service is comprehensive and includes catering, equipment, dinner tables, floral arrangements for meetings to remember. Accessories, machinery and supplies are all of professional quality, so as to ensure you with the best quality event. Our staff is highly skilled and qualified. 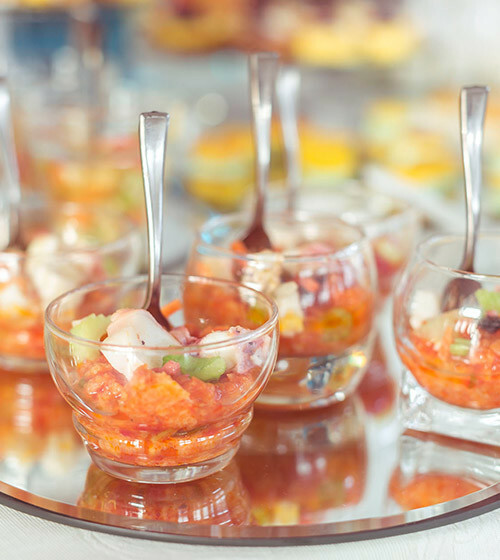 Our catering service can adapt to any of your requirements. On demand, any alimentary request may be fulfilled, whether it be taking into account allergies, intolerances, or specific diets such as meat-free, dairy-free or gluten-free. In addition to the dining room staff, we can also provide you with a bar service, with staff specialized in the preparation of cocktails and drinks. For your weddings, banquets, meetings, conventions and business lunches, wherever your heart takes you, the Piccolo Mondo is there with you.